Blue City. 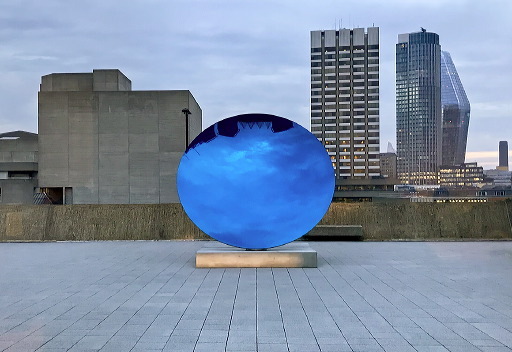 Part of the excellent Space Shifters exhibition in the Hayward Gallery at London's Southbank Centre, in Autumn-Winter 2018, this blue concave lens on the Hayward's outdoor sculpture terrace gives us an inverted wideangle view of the sky and the distinctive roofline of the lower galleries. The work is 'Sky Mirror, Blue' by Anish Kapoor, one of a series of 'sky mirrors' that he bagan in 2001. The blue stood out strongly on a dull grey Winter's day. I shot it on an iPhone 7 through the window of the upper galleries, and I'm amazed at the technical quality of the original image from such a small sensor when viewed at 100% in Photoshop. Not a lot of post-processing other than tweaking the verticals and removing a CCTV camera that a judge didn't like!